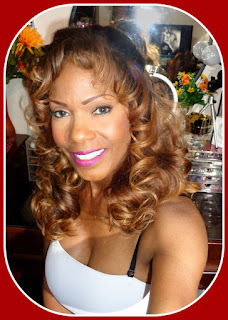 I would like to introduce to you a line of pure natural products from Eden Allure. 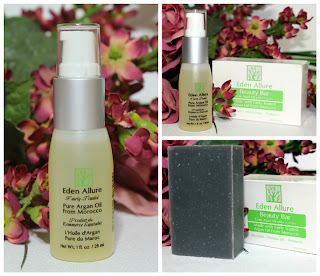 I was invited to try out two products, the Eden Allure Pure Argan Oil from Morocco and the Eden Allure Beauty Bar also made from Pure Argan Oil from Morocco. If you aren't familiar with Eden Allure Argan Oil it is 100% pure, harvested exclusively in Southwestern Morocco and is very popular for it's amazing anti-aging, skin nourishing and therapeutic properties. Argan Oil has been around for hundreds of years and used exclusively by the women of Morocco for all of their beauty and skin care needs. Argan oil is extracted from the almond of the fruit of the argan tree. This unique tree grows only in the South-Western part of Morocco and is also known as "The Tree of Li. Pure Argan oil used internally has been shown to fight cancer, cardiovascular disease, and inflammatory disorders. 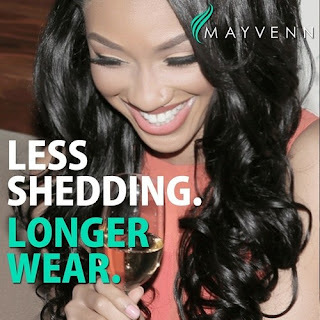 When applied externally, it cures everything from scars to infections to split ends to stretch marks. The argan oil, thanks to its high content of vitamin E, is ideal to fight against drying and ageing of the skin and it is also perfect for strengthening the nails as well. One of the tried and true beauty regimens of using Argan Oil is in the beauty of soaps. My experience using both products has been incredible. I wanted to have the best experience possible so I decided to add 10 drops of the Eden Allure Argan Oil to my bath for a soak. After about a 30 minute soak, I then showered using the Eden Allure Beauty Bar. Both products left my skin amazingly soft and smooth and I have been using the Beauty Bar ever since. Eden Allure is giving 20% off their entire line of products using the code "Youtube"! Ways to connect with Eden Allure!